From Sumburgh Airport, take the A 970 to Lerwick (approx 35 miles). Enter Lerwick and follow the signs for Old Port. At the top of the hill that leads down into the Old Port, turn sharp right into Knab Road. The cemetery is situated at the junction of Knab Road and Gressey Loan. 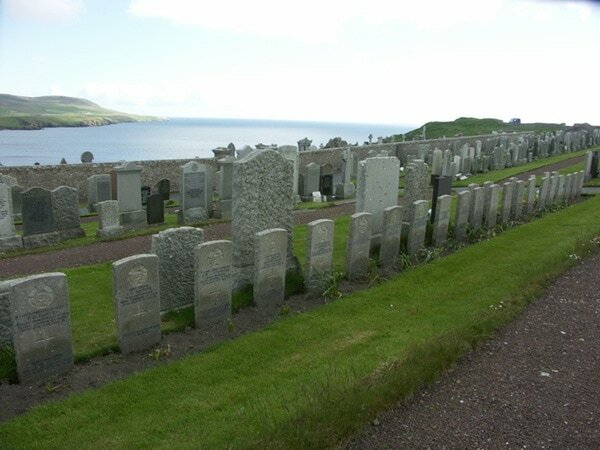 There are 42 Commonwealth burials of the 1914-18 war here. There are a further 74 of the 1939-45 war, including 2 unidentified sailors of the Royal Navy and 1 unidentified seaman of the Merchant Navy. There are also 3 Norwegian war burials here. J/7594 Flight Lieutenant David Ernest Hornell, V. C.
162 Squadron, Royal Canadian Air Force, died 24th June 1944, aged 34. Plot Terrace 7B. 17. Son of Harry Alexander Hornell and Emily Crook Hornell; husband of Genevieve Madge Hornell, of Drayton, Ontario, Canada. Citation: The following details were given in the London Gazette of July 25th, 1944:- Flt. Lt. Hornell was captain and first pilot of a twin engined amphibian aircraft engaged in an anti-submarine patrol in northern waters. A fully surfaced U-boat was sighted travelling at high speed on the port beam, and Flt. Lt. Hornell at once attacked. His aircraft had been seen and there could be no surprise. The U-boat altered course and opened up with fire which became increasingly fierce and accurate. At a range of 1,300 metres the guns of the aircraft replied and hits were obtained, but the aircraft itself was hit and badly damaged, and its starboard gun jammed. Ignoring the fire Flt. Lt. Hornell carefully manoeuvred for attack. Holed in many places, oil pouring from the starboard engine which with the starboard wing was on fire, and with petrol tanks endangered, the aircraft was very difficult to control. Nevertheless the captain decided to press his attack, and bringing his aircraft down low released his depth charges in a perfect straddle. The bows of the U-boat were lifted out of the sea; it sank, and the crew were seen in the water. The plight of the aircraft and crew was now desperate. With the utmost coolness Flt. Lt. Hornell took his badly damaged, blazing aircraft into the wind and brought it safely on to the heavy swell where it rapidly settled down. After ordeal by fire came ordeal by water. Two of the crew succumbed from exposure, and the survivors were finally rescued after 21 hours in the water. Blinded and completely exhausted, Flt. Lt. Hornell died shortly after being picked up. 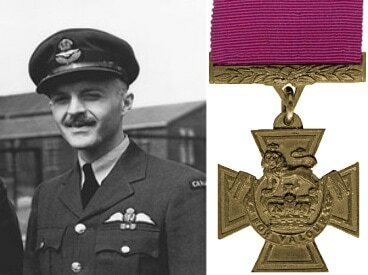 By pressing home a skilful and successful attack against fierce opposition, with his aircraft in a precarious condition, and by fortifying and encouraging his comrades in the subsequent ordeal this officer displayed valour and devotion to duty of the highest order.